It took me a ridiculously long time to figure out that pink shape was a pig. 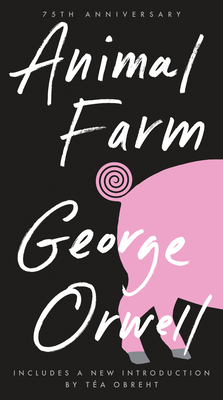 This is my first read by George Orwell, and it's terribly clever. It's short—just slightly over 100 pages—and the premise is simple. That's the genius of it: Animal Farm could be a parable about any uprising from the French Revolution, to the Bolshevik Revolution, to the Egyptian Revolution in 2011. Perhaps even the American Revolution. It was chilling yet totally convincing. That's not to say the book is all political talk. It's also about society and economics and technology. But more than that, it's a great story that makes you think, and the animal characters are surprisingly sympathetic. Right from the beginning you feel for them, even though it's obvious their dream of a utopian society is NOT going to work. From the vain pony, Molly, to the cynical donkey Benjamin, the animals feel like characters you can identify with. I spent the entire book on the edge of my seat hoping the noble workhorse Boxer wouldn't die, even though I KNEW he would. And when it did happen, it was even more awful and cruelly ironic than I anticipated. I was also surprised by the message of the novel. When I first started it, I figured the moral would be that the animals' idealistic society was doomed to fail because animals (read: people) were inherently selfish and out for themselves, but that wasn't the case at all. The majority of the animals were good, or at least good up to a certain point; they worked hard just on the basis of hope for a better life and that someday it would pay off. The reason Animal Farm failed was actually because it was modeled directly off of the human world and Manor Farm. The pigs got all their ideas from human books, even applying war maneuvers from Ancient Rome! Pretty soon some of the pigs were acting like Roman Emperors. It's the culture and system itself that supported exploitation and oppression, which is why it was nearly impossible to change. Animal Farm entertained me while making me think about things in a different way. Just see if I don't start shouting, "Four feet good, two feet bad!" the next time I see a pundit on TV. I would recommend this novel as a must-read to everyone.